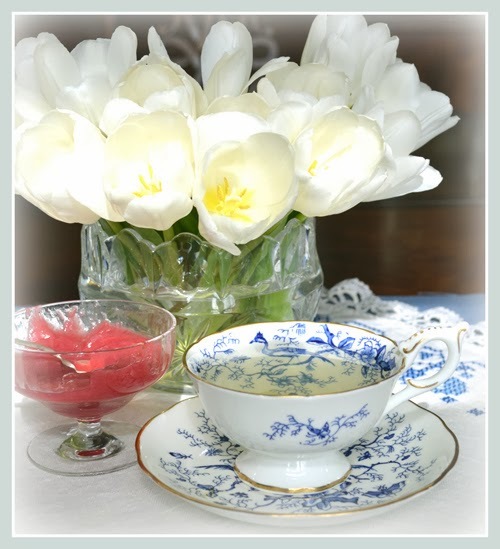 It was a lovely afternoon for tea. some realistic and some fanciful. I love her swirly touches. Martha, I am still enjoying your beautiful gift! 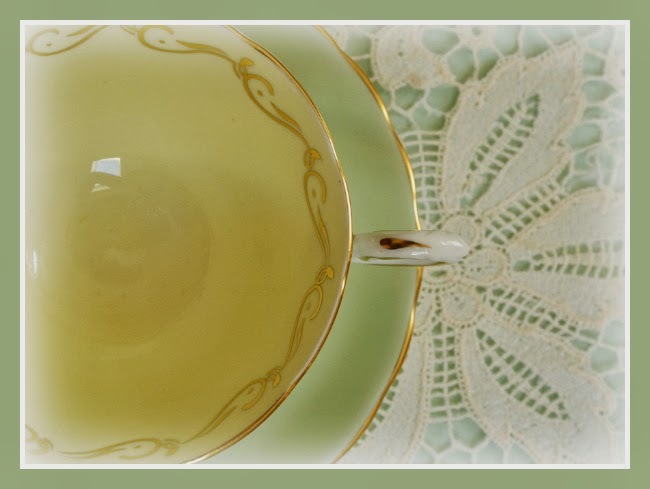 Tea drinking promotes creativi-tea. lol! 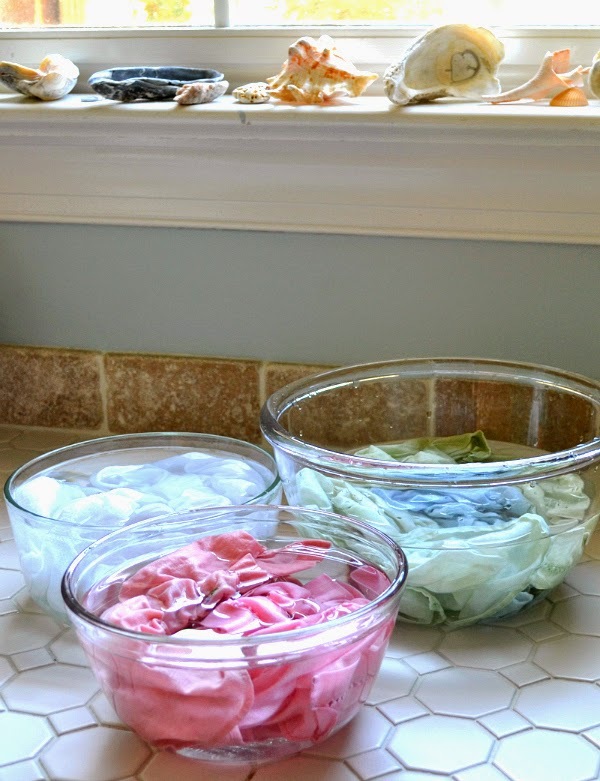 and began soaking them last week. 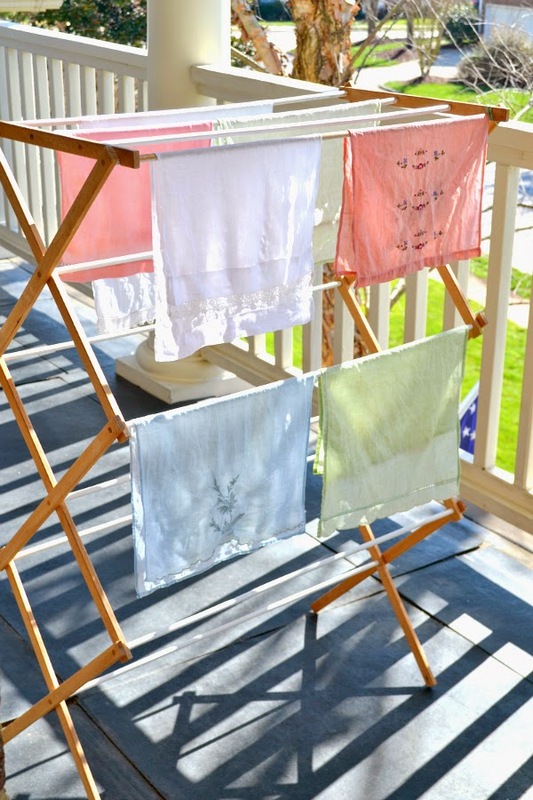 if you soak natural fibers long enough. and the smell is priceless. I now have a nice little stack of vintage linen towels. I realized it is warm enough to re pot my flowers. 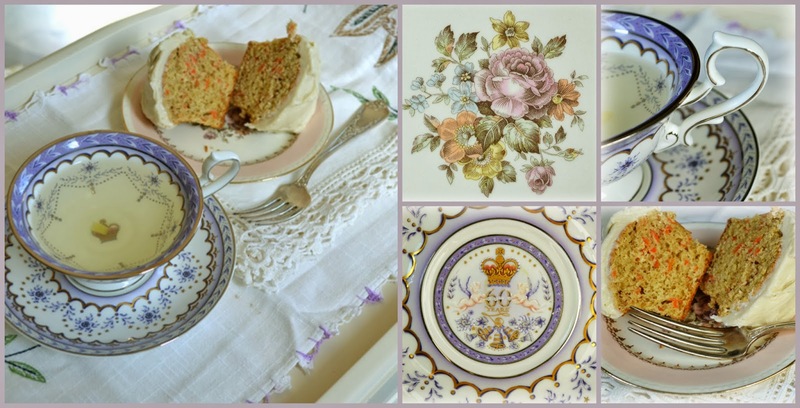 It is time to get the balcony ready for enjoying tea! Last year I enjoyed many tea moments out on this balcony. and have the furniture brought out. I may be able to get Bertha out and have tea in my tea tent! she is a real joy to be in. now that the sun is out again. What kind of summer dreams have you? Thank you again for stopping by for tea! I am joining Bernideen, Sandi and Ruth for tea today too! 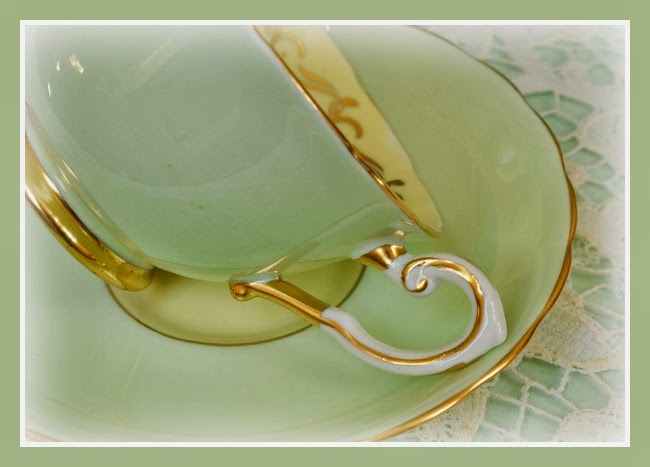 just link your tea cup post below with Linky Tools. Then we can come and visit you too! I wanted to share with you a kindness Sherry gifted me! Sherry is a creator, she makes things, fab things, all the time. See this lovely blue fabric circle ornament? Isn't it sweet? I have never made anything like this. and see the blue cloth underneath? That is a gelli plate piece! 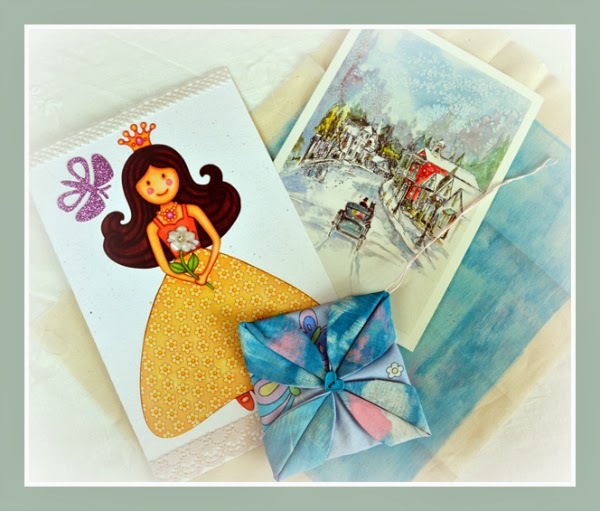 with some of her gelli plate fabric, she kindly sent me some too! 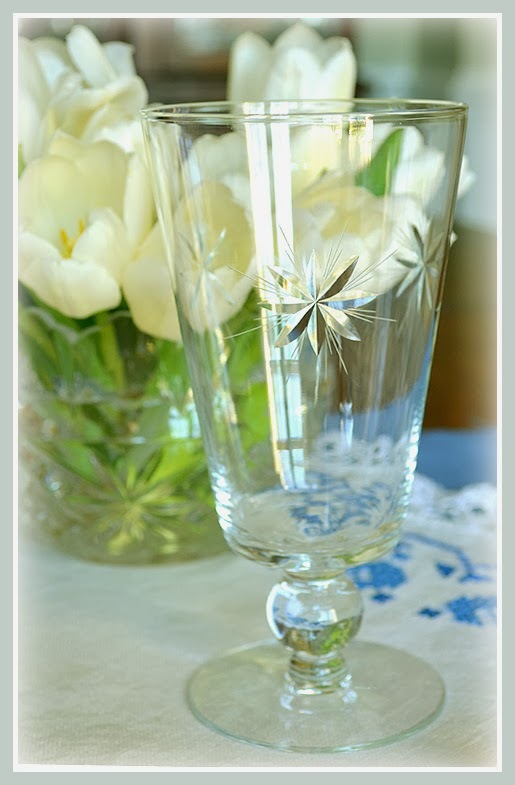 If you haven't been to Sherry's blog Creatology yet, stop by for a visit. Sherry sews....sews and sews! She also makes jewelry too! she may be working on a project that helps out others. That is what she is like. and that felt really good. 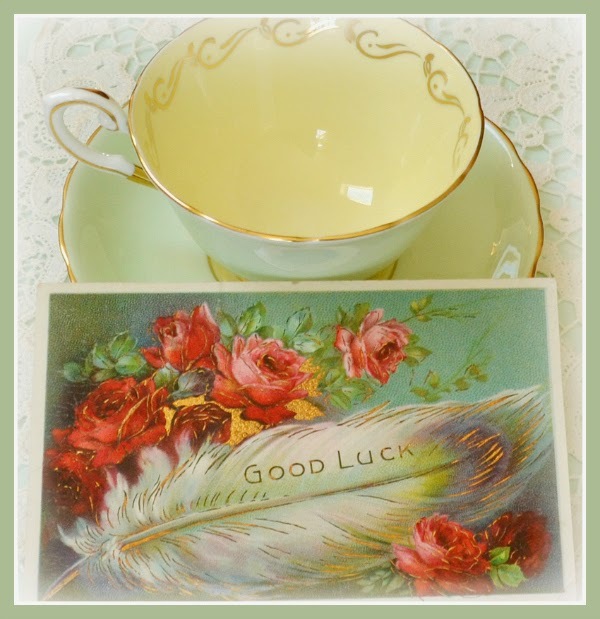 I have been under the weather and missing tea time with you all! 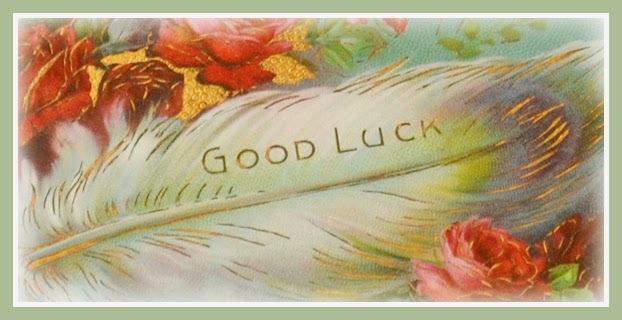 This week I will be visiting as many of you as I am able. 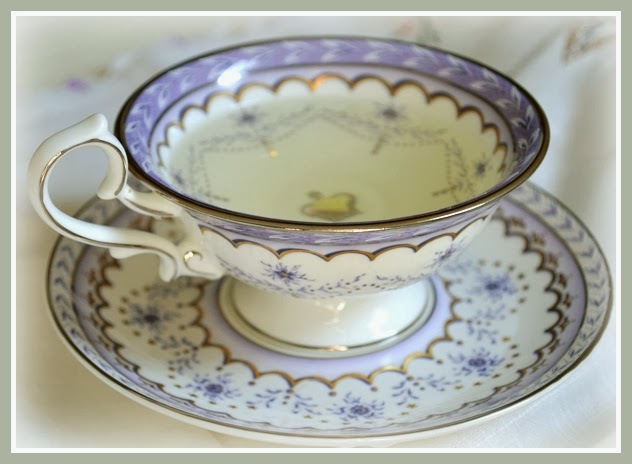 I have a new tea cup to share. I am sipping herbal tea from her minty green goodness. She is a simple beauty.. 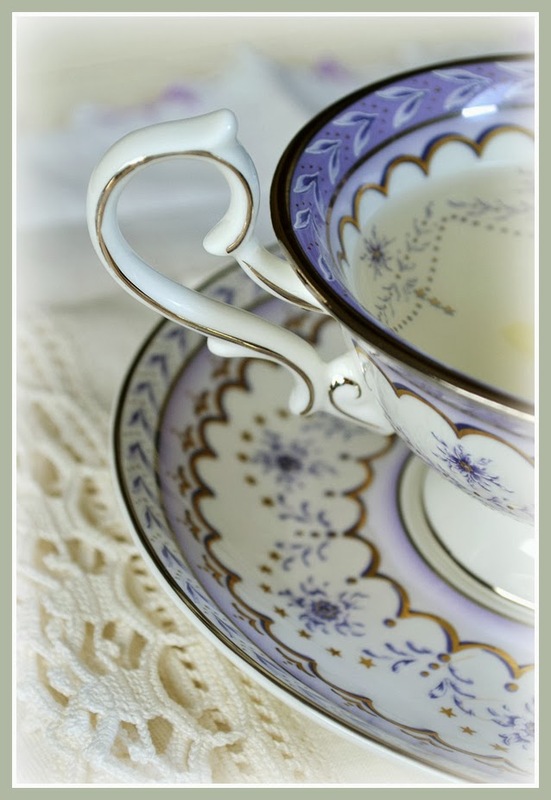 Her classic handle is elegant, and embellished with gold trim. Her golden scroll work is just enough to distinguish her. 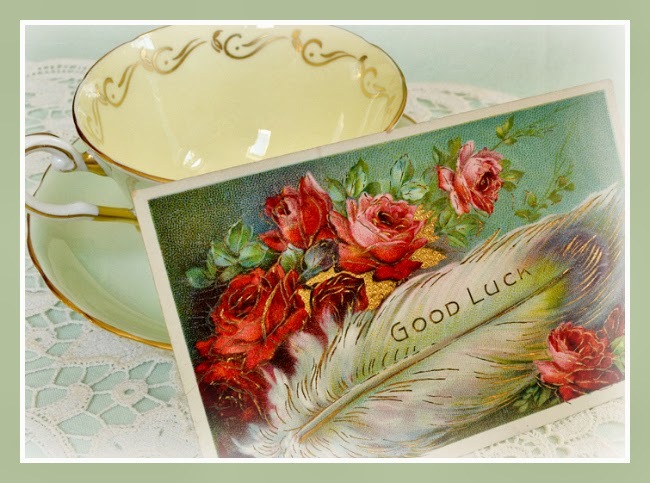 I have always found vintage postcards fascinating. It amazes me how much you can find out about some of them. "Dear Edna, Why didn't you come Sunday? I looked for you all day. I still have a headache." 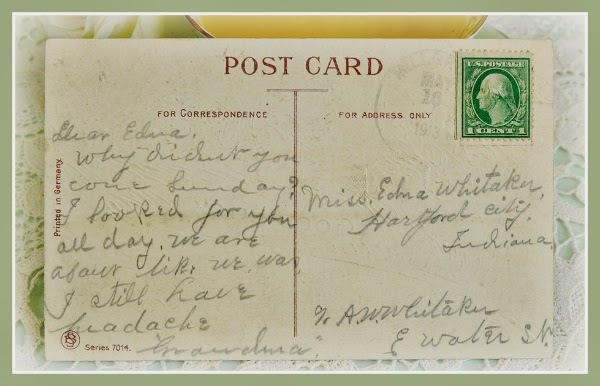 Grandma seems to think Edna still has the headache they both shared. that they did not live close together. 5.8 million telephones connected in the United States. Remember in the Downton Abbey episode when they installed their first phone? Maybe A.W. Whitaker did not have a telephone yet? Or maybe grandma didn't have one. 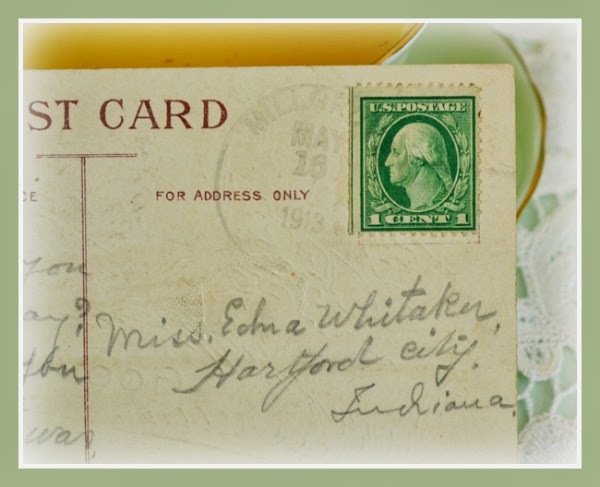 Instead she bought a beautiful postcard and paid 1 cent to mail it. she may have had that headache all week. I became curious and looked online to see what I could find about Edna. I actually found her in the 1940 census. A.W. was her father, Alexander Whyte (?). Edna was still living at home at 44 years old. She was 17 when she missed her visit. about 6 miles from the Hartford stop where Edna lived. Maybe Edna took the train when she went to visit her grandma? In 1913, 6 miles might have been quite the trip. 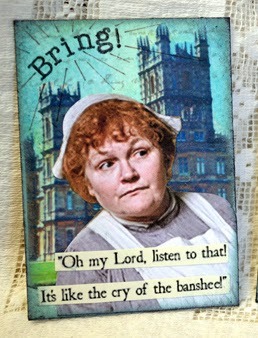 I do not know that they were going to have tea that Sunday afternoon. It does seem possible for that time period as well as time of year. we could use a landline, or a cell phone. We could Skype or Facetime and even see the person! Imagine what Grandma and Edna would have thought of that! that 100+ years later someone would be interested in them? And put their correspondence online??? I hope they wouldn't mind. we can do it in Bloglandia too! 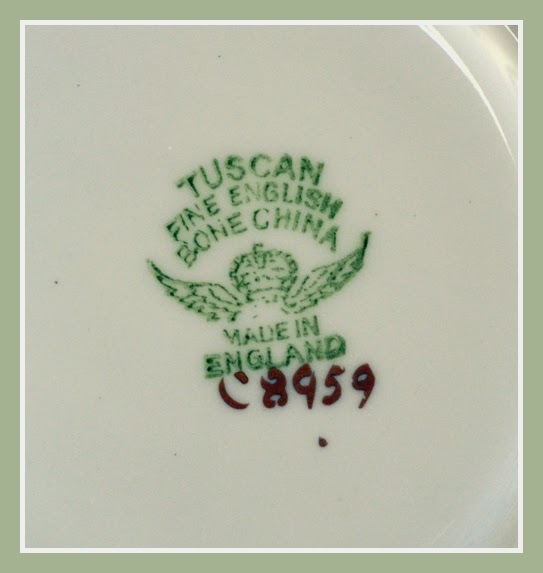 (Tuscan China was the manufacturer of this lovely cup. 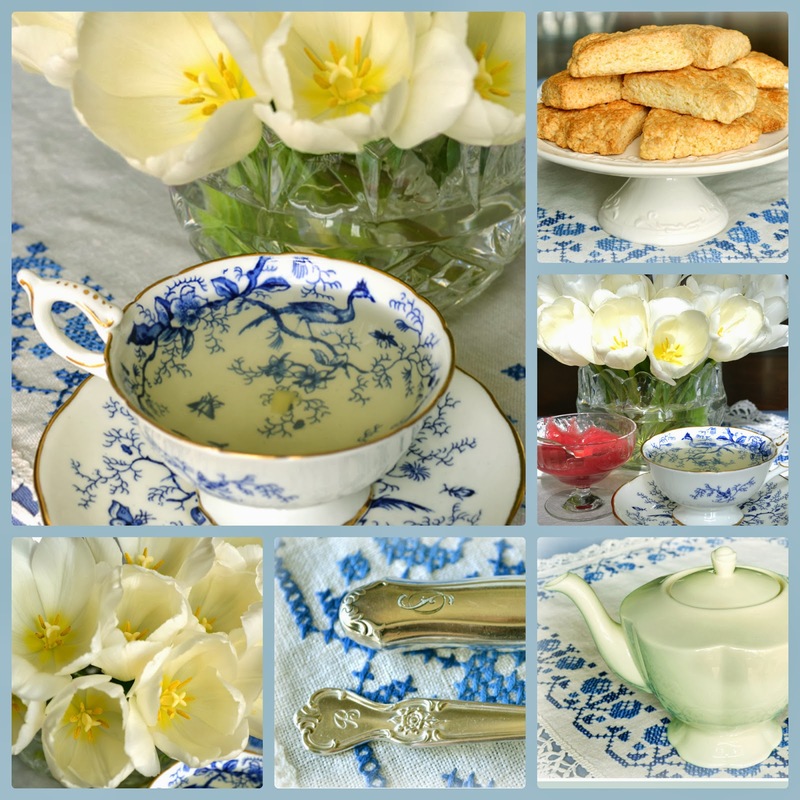 Thank you so much for joining me for tea today! 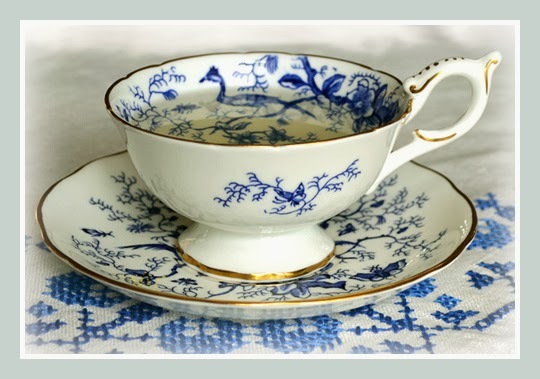 just link up your post with your tea cup in it below. 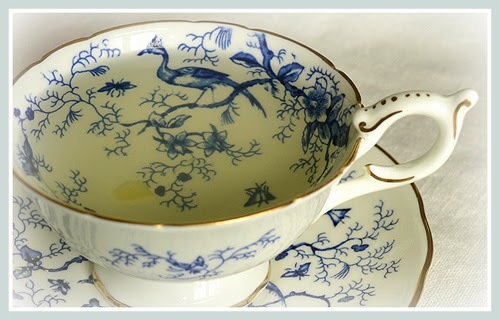 who is having a Bird Lover's Tea next week. hence my birdie post today. Thank you Sandi for all the hosting and inspiring you do! Next week make sure you link up with sweet Martha for T.T. over at Martha's Favorites . Today's tea was enormous fun to prepare. which I have shared before. It is a beautiful one given to me by my sister. 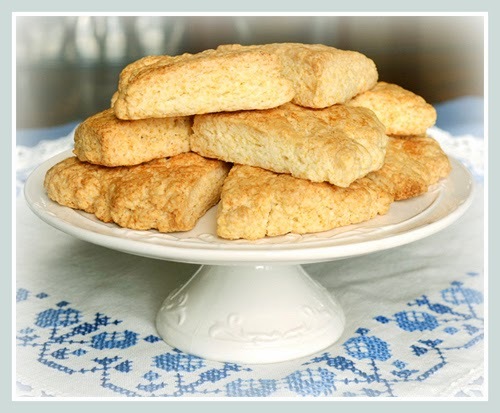 from my favorite GF biscuit and scone mix. happy with what I have tried. My husband and I made some rhubarb jam! and this is John's recipe for Rhubarb Jam that we followed. So we have this extra luxury today. We were quite delighted with the outcome! 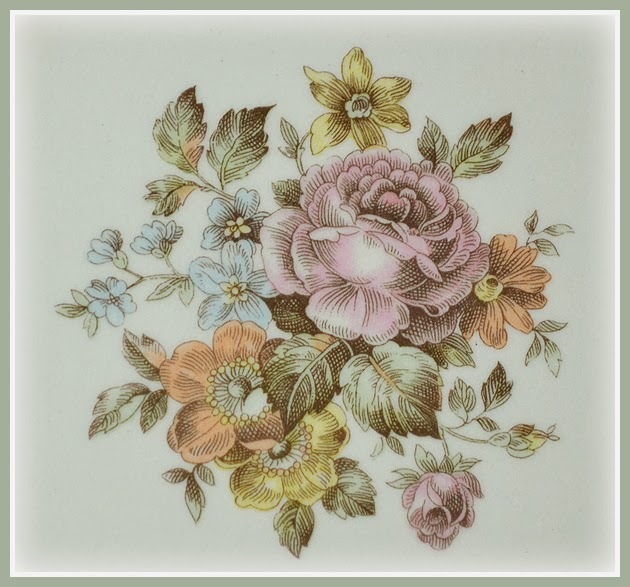 I set the table with a sweet vintage embroidered linen. I found this glass and various companions at the local GW. 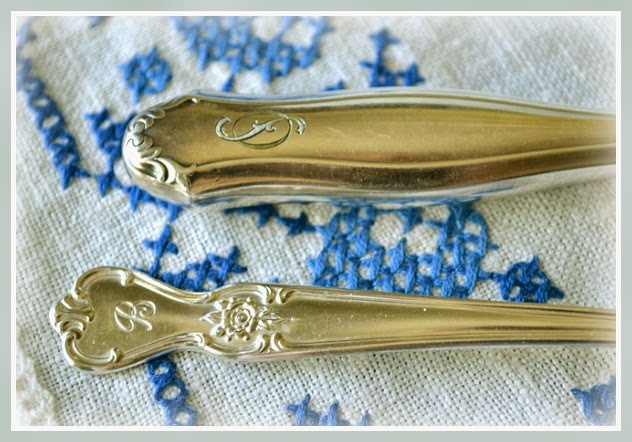 Odds and ends cutlery from friends and antique markets. 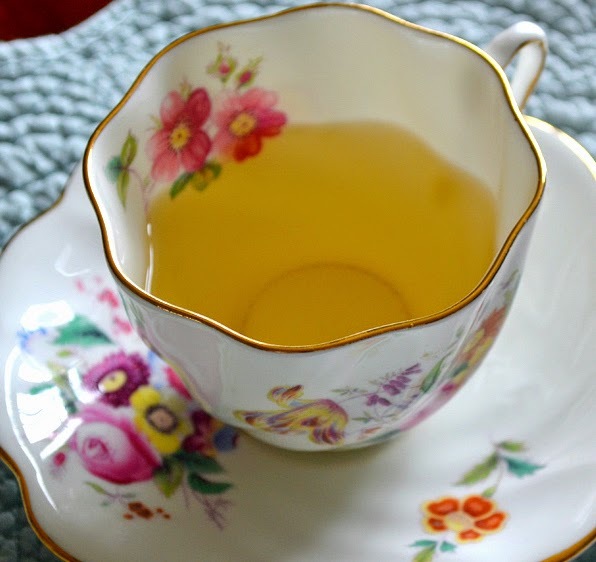 My favorite...no not chamomile anymore...but fresh ginger tea. maybe even a cricket or beetle! 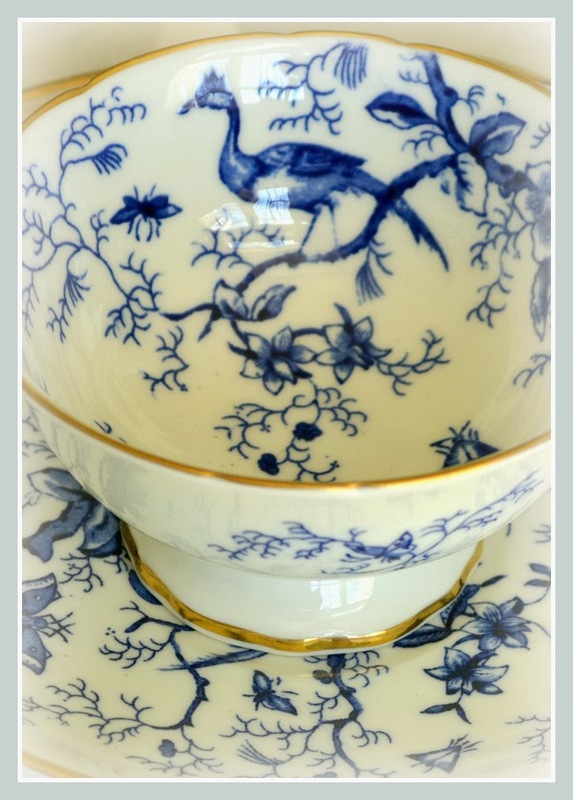 Birds on tea cups are always lovely! and the blue on white really shows off the artwork at it's best. 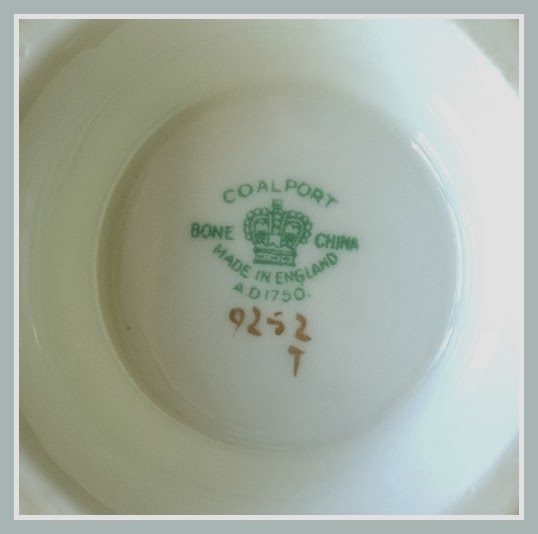 This beauty was manufactured by Coalport. the person who worked on this cup. 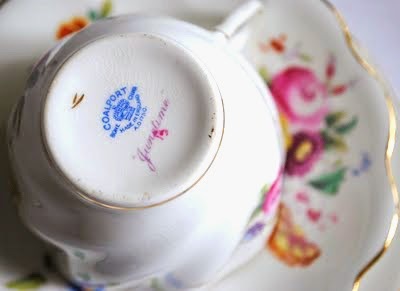 indicate this cup was manufactured after 1920 but before 1939. She is at least 75 years young. 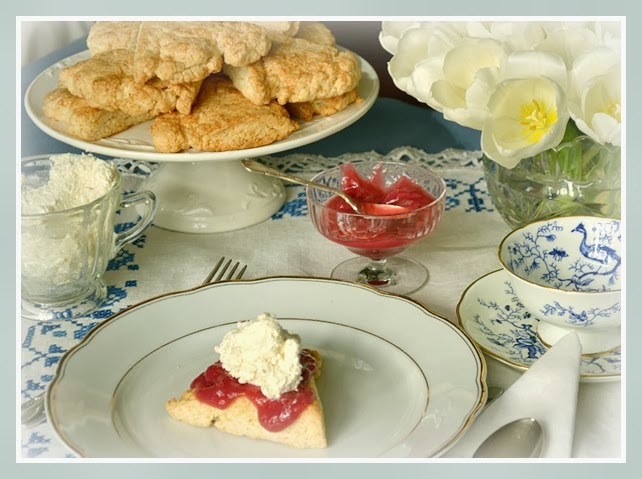 Remember Sandi's Special tea next Tuesday! 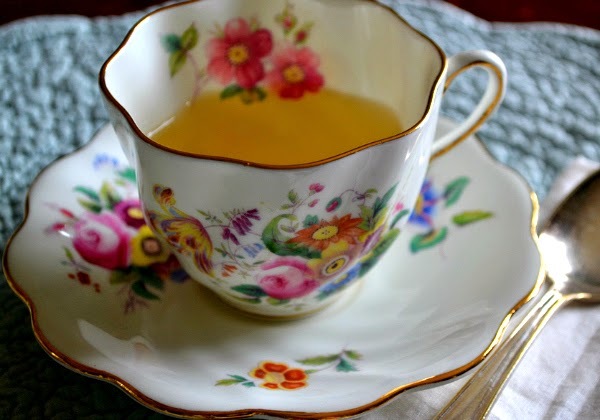 Tea Cup Tuesday-Gloomy Day...Cheery Tea! 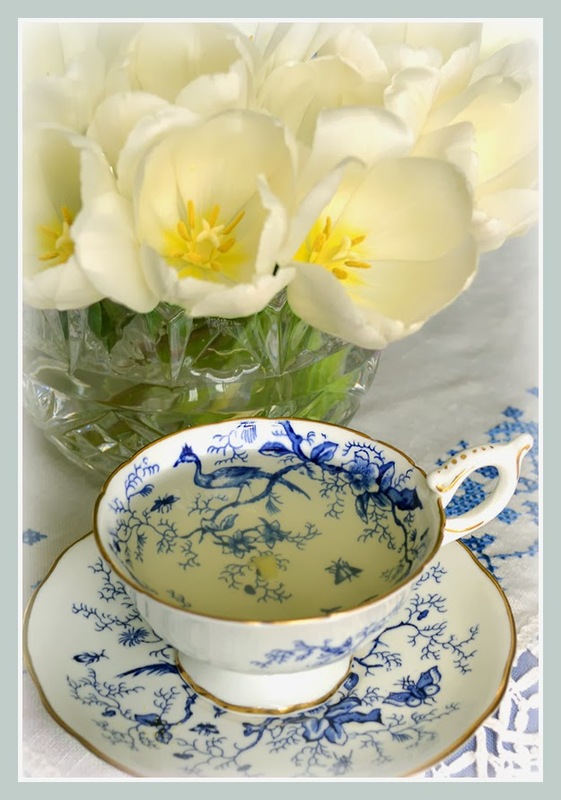 Welcome to Tea Cup Tuesday with Martha and me! now we have snow and ice! it feels really cold right next to a warm day! 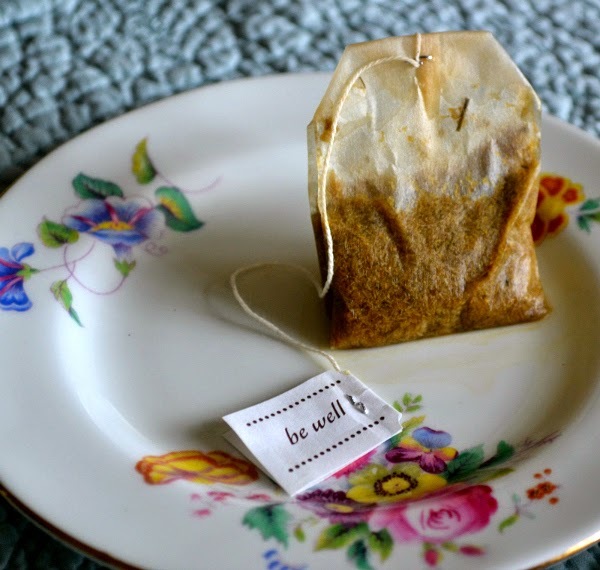 good excuse for a cheery tea! 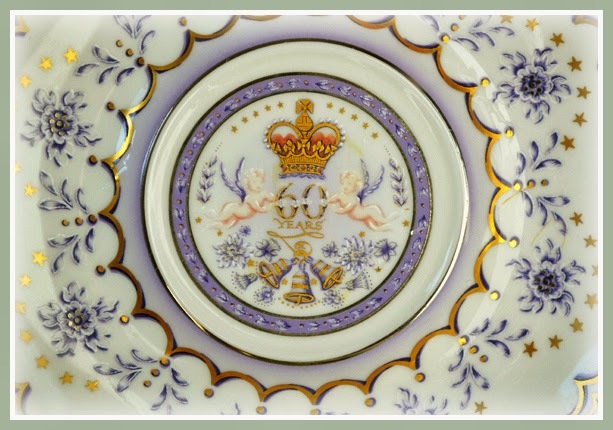 the 60th anniversary of Queen Elizabeth and Prince Phillip. The design is raised, and so delicate. Her coloring too is just a joy to see. Hence, perfect for a gloomy day. 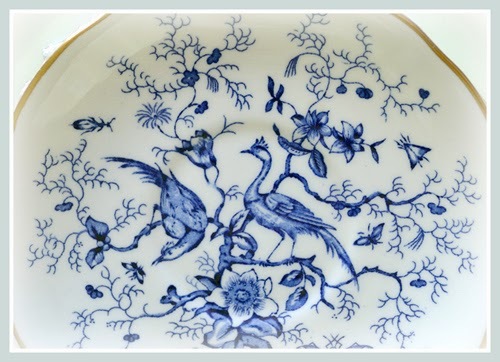 The saucer is a sweet composition with cherubs and bells. I love the gold stars. 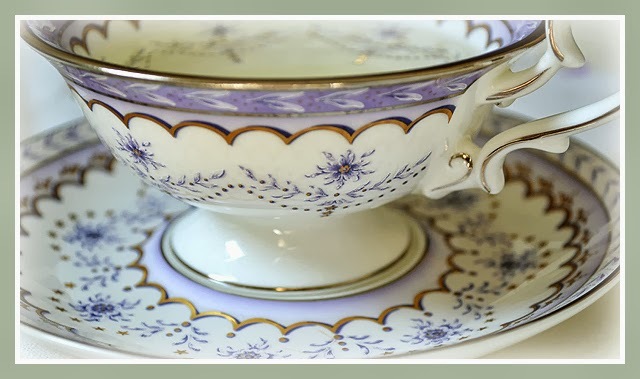 She has a beautifully scrolled handle...very elegant. 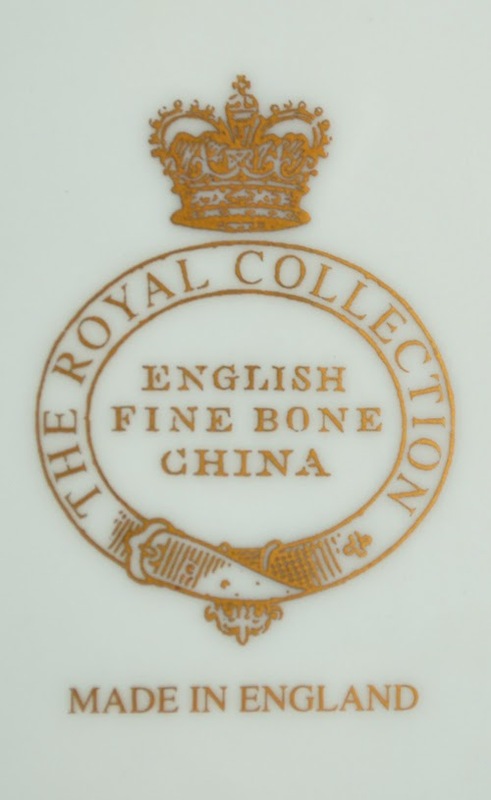 She was made by The Royal Collection. that specializes in English commemorative products. This cup was created in 2007. 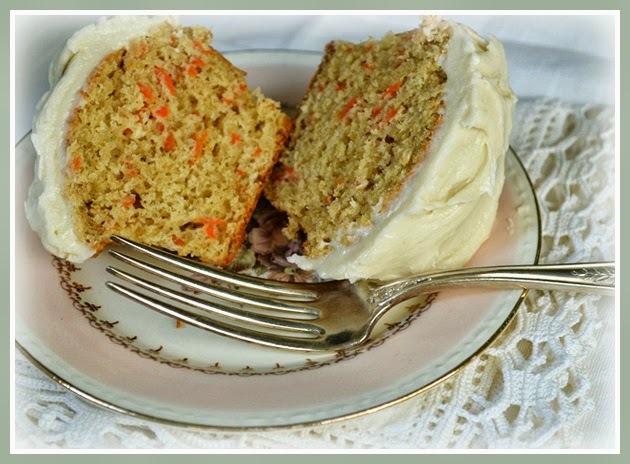 Carrot and cream cheese frosting cupcakes....Yum! I used a gluten free mix by King Alfred. I picked an American made dessert plate. 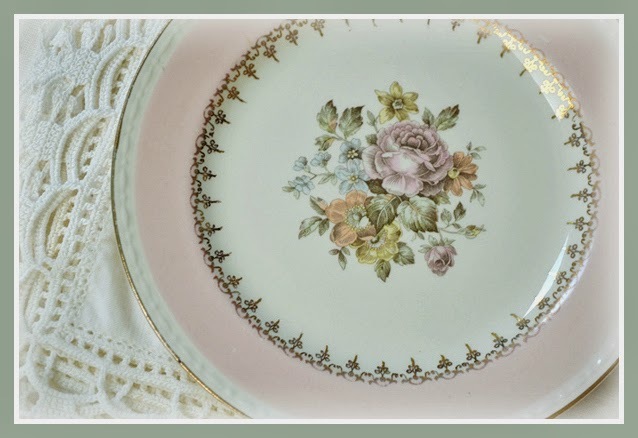 The soft pink and the gold filigree are so sweet. The flowers in the center are lovely! 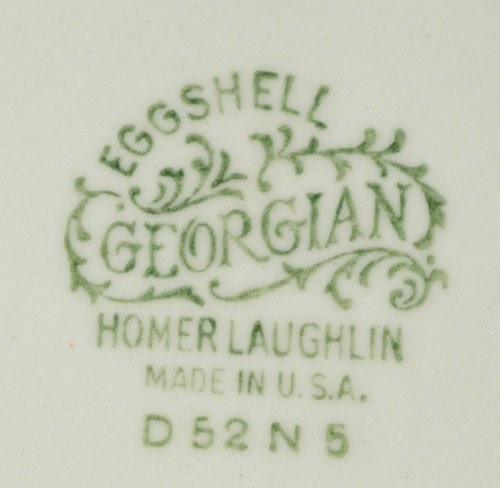 This sweet plate was manufactured by Homer Laughlin around 1951. Arcadia pink band Eggshell Georgian is her name and color. I was just over at ebay and saw her as well as her brother in blue. 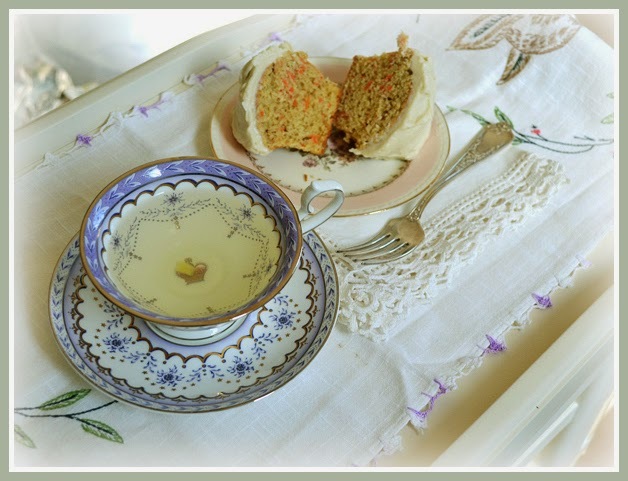 On my tea tray I have used a vintage dresser runner. This embroidery work really caught my heart when I first saw it. 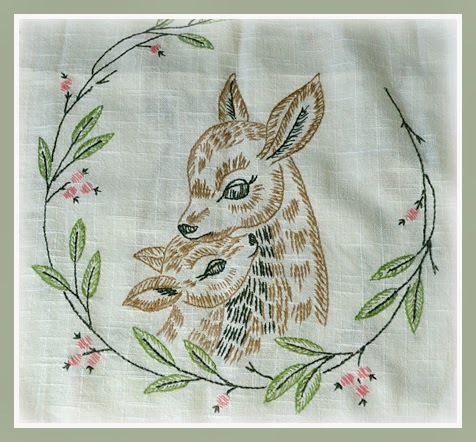 Finding vintage linens is always a treat for me. 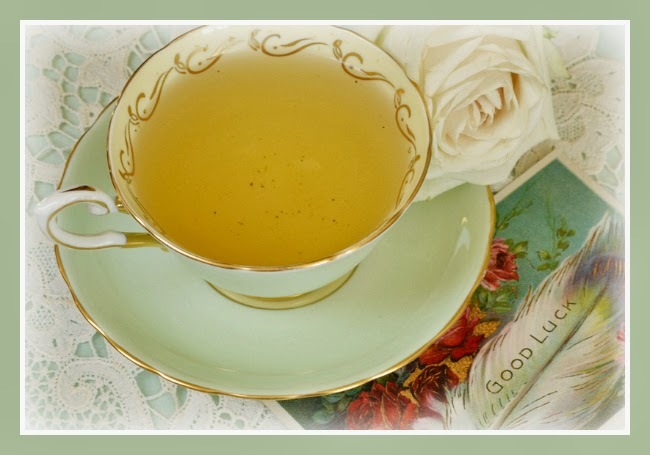 so I will enjoy my cheery tea and be patient. Your visits really make the winter a delight!